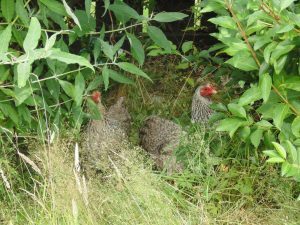 Before deciding whether keeping chickens is for you it is worthwhile considering the benefits of keeping chickens and the drawbacks. Saving Money – the Economics of Home Produced Eggs. There are, of course, a few reasons not to keep chickens. I can see the attraction in keeping chickens as a pet, with the benefit of some eggs as well. They may not be as trainable as a dog but they are appealing creatures with their gentle clucking. Great for telling your troubles to! Many people enjoy keeping and breeding fancy breeds, which they can show. Some of these pure breed show fowl are really spectacular in appearance with brightly coloured plumage. You can save money by keeping chickens for the eggs, but not a lot. What you can do is enjoy the other benefits of keeping your own hens and know it is not actually costing you anything to enjoy a superior product. I’ve detailed the costs and returns on keeping a few chickens for the eggs here. My calculations show that keeping three chickens at home will, ignoring the cost of your labour, provide a modest profit against buying free-range eggs and yet more profit over buying quality organic eggs. You can see from the economics that there is not a huge profit in keeping chickens. It’s also well known that the giant supermarket chains are not generous with their suppliers and those suppliers have additional costs for labour, labelling equipment and distribution to accept. In fact, you wonder how they do it. Something has to be squeezed and looking at the regulations for poultry keeping, the animal welfare is one area that they squeeze. Katie Thear’s Organic Poultry goes into some detail of the organic and free-range standards and the stocking densities allowed by law. It may surprise you. Eggs purchased from the supermarket or shops are generally of high quality and freshness. No longer do people have to break an egg into a cup to check it hasn’t gone off before use. Despite that, most home keepers of chickens and their friends would tell you that their eggs are far superior to shop bought eggs of whatever type. Control of the diet and a more varied diet can contribute towards nutritional value so our own eggs may well be healthier for us. There is scientific evidence that free-range eggs contain higher amounts of folic acid and Vitamin B12 and Vitamin A than battery eggs. Home kept chickens, with a more varied diet than commercial free range may well be better for us than that. Of much greater concern and importance to the consumer is the evidence of potentially dangerous drug, hormone and antibiotic residues in commercial eggs. Free range does not mean organic and the commercial free-range producer may well utilise feedstuffs that contain these additives. We are what we eat and the accumulation of these micro toxins in our systems could be having unforeseen effects. In 1999 0.5% of eggs contained residues of Dimetridazole (DMZ). This is not even licensed for laying hens and is suspected of causing cancer and birth defects. At the same time, one egg in every dozen contained levels of Lasalocid in excess of 100 micrograms per kg. Again, this is not a licensed product for laying hens. The government watch over our food safety by testing one in every 18 million eggs consumed, which is hardly reassuring. Some people are quite phobic about birds. Health concerns – although I personally believe the concerns over Avian Flu are overstated, it is a concern at time of writing. Waste disposal – chickens produce manure but if you can not use it just find a gardener who can. 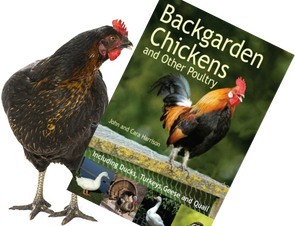 Local regulation may prevent you from keeping poultry in your garden. 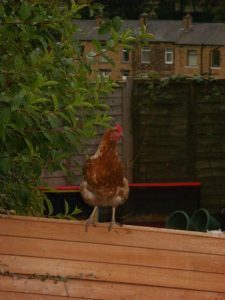 Like any pet, you need to arrange someone to look after your chickens when you are not there.